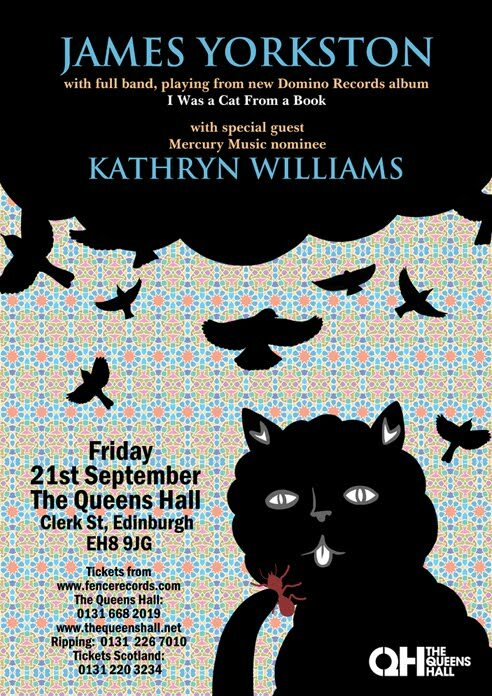 I seem to keep seeing news stories about how we'll all be subsisting on fried jellyfish and Kelloggs cockroach flakes in thirty years time, so it seemed apt to have a cat licking tentatively at an ant on this poster for celebrity vegan James Yorkston's upcoming Edinburgh show with Kathryn Williams. I'm a huge fan of James's music, so it was a total pleasure to put this poster together. The gig is in support of James's new album, I Was a Cat From a Book, and I think I must have listened to it about twelve or thirteen times in the last week. On the first couple of listens, I wasn't sure if it sounded quite as cohesive as a collection of songs as some of his previous albums. But I was wrong - it turns out that it is simply that each song is so incredibly good that it demands your complete unswerving attention, like a series of intense but captivating one-to-one conversations with different people in a crowded room, your mind always vaguely conscious of the surrounding social clamour whirling around you, but everyone else nonetheless briefly fading to nonexistence. Some of the songs are so heart-breaking that they can't help but stand out in the room. But it's an all together relaxed gathering, exquisitely coordinated - and the finger food is smashing. And, by the end, everyone is dancing and it's an evening no one is likely to forget.